Every year I use Sand Art to teach kids about how Sedimentary Rocks form in layers. This is always one of my camper’s favorite activities. Sedimentary rocks are ones that form in rivers, lakes, oceans and deserts. Sediments like clay, silt, and sand deposit in layers in these settings. Some layers can be very thick like sand layers in the desert or they can be thin like alternating layers of clay, silt, and sand in an ocean that change over time as the position of the high tides and shoreline gently moves. 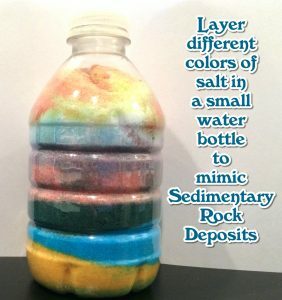 This activity gives kids the ability to make their own sedimentary layers using a variety of thicknesses and colors representing different types of sediment. Sand Art gives kids a great visual representation of these different layers. Over the years, I’ve found a great way to do this activity without breaking the piggy bank. Pre-colored sand can be very expensive at craft and hobby stores. A great alternative is using salt that you color at home with liquid food coloring. To color the salt, use a glass bowl, a half to full box of table salt, several drops of food coloring, and a spoon. Stir the food coloring into the salt until the color is uniform. Allow the salt to sit, stirring occasionally, until the salt is again dry and pours easily. You can use less food coloring to make lighter colors that dry quickly or more drops of food coloring to make darker colors that take just a little longer to prepare. If you are really adventurous, try mixing the food coloring to make colors such as orange, purple, black, and teal. In camp, I use small, water bottles that are empty and dry. When you are ready to begin, give each child a piece of paper and some tape. Show them how to twist and secure the paper into a funnel that they can use to keep the salt inside the bottle rather than all over the floor. This is where the fun begins. I let the kids make their “sedimentary rocks” in any way they want from the color choice to the thickness of each layer. Have kids fill the bottle all the way to the top and then place the lid on the bottle to keep the layers from mixing. 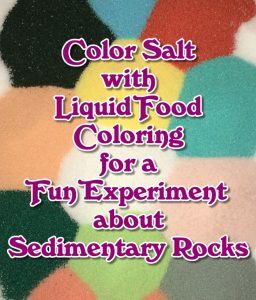 If you have any questions about this experiment or other fun geology activities for kids, visit us as www.MiniMeGeology.com. We have some great free puzzles at the Dig Into Geology section of our site. To throw your own summer Rock Camp, check out our Rock Detectives Camp Guide for ideas and instructions.